Krones’Deco Type digital direct printing machine won the Beverage Innovation Award 2014 in the “best technology innovation” category. Compared to dressing containers in labels, direct printing provides significantly enhanced freedom for attractive, individualized design, and is suited for supporting product launches and marketing campaigns, said Krones. 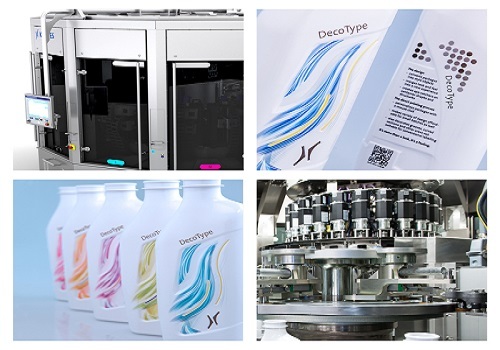 Increasing demand for individualization leads to decreasing batch sizes with concomitantly small label runs, with which digital direct printing has an edge over traditional label. The highly flexible decoration technology avoids any overproduction of labels, eliminates the use of adhesives and reduces storage costs. With the DecoType, using UV inks, imprint heights of up to 200mm can be achieved. Haptics and visual appeal can be combined, or uneven surfaces printed on. Furthermore, artwork can be simply and immediately converted into a printed image. Variable data like barcodes or the sell-by date can be integrated, all the way through to individual product tracking. According to Krones, the compact machine is suitable for handling empty plastic containers made of polyethylene terephthalate (PET), polypropylene (PP) or polyethylene (PE), and also in different shapes. Beverage Innovation Award is organized by FoodBev Media and was in its 11th year. The prize presentation ceremony was held during&nbsp;BrauBeviale 2014 in Nuremberg, Germany, on&nbsp;November 12.